In June 2017, the Guardian newspaper reported that Peter Thiel had been granted full citizenship to New Zealand in 2011. Why was this news? It’s because Thiel had spent just twelve days in the country. For the rest of us, this process requires you to reside, after you have been given permanent resident status, for at least 1,350 days in New Zealand in the five years before you apply for citizenship. The New Zealand government defended its action by saying that Thiel’s citizenship is in the public interest and that Thiel would be a high profile ambassador for New Zealand, helping to promote the country and potentially make it an attractive destination for tech startups. So, why did the New Zealand government pull out all the stops and make it happen? Peter Thiel is a venture capitalist. He’s the guy behind Paypal, and he’s on the board of Facebook. Oh, and he’s a billionaire. So, what has Peter Thiel got to do with cryptocurrencies? After graduating from Stanford and studying law, Thiel quit his job after seven months and became an options trader for Credit Suisse. He started out as a venture capitalist by raising $1 million from family and friends. It’s easy to look back in hindsight and think that successful people are always winners, but the reality is different, and Thiel’s first $100,000 investment failed. Thiel’s next venture was called Confinity. He realised it was possible to develop software to make online payments and solve a gap in the market. At the time, internet commerce was beginning to boom, but many merchants could not provide a way for their customers to purchase from them. Thiel realised that a kind of digital wallet would make it much easier for online sellers to sell their goods and online customers to pay for them. In 1999, Confinity launched Paypal. Three years later, in 2002, Paypal was sold to eBay for $1.5 billion. Thiel is the backer of many other successful ventures, but the most well known, after Paypal, is his angel investment in Facebook in 2004. Thiel made a $500,000 investment for a 10.2% stake in Facebook and joined Facebook’s board of directors. In mid-January 2019 Facebook’s market capitalisation is $431.183 billion, or put another way $431,183,000,000. In 2012 Facebook shares were made available to the general public in a much publicised initial public offering (IPO). Thiel sold 16.8 million Facebook shares at the IPO, worth around $640 million at the time, and since then he’s sold a further $500 million. Thiel still owns around 160,000 Facebook shares and has seen his initial $500,000 investment produce over $1 billion of returns, giving Thiel gains of over 200,000%. Paypal was a big outrageous idea. And it worked. Thiel argues that the single most important pattern that he’s noticed in his career is that the most successful people find value in unexpected places. Most people today look for security in the here and now. A consultant, hired, early in the Paypal’s growth story, to negotiate business development deals, negotiated what he thought was a great deal for himself. $5,000 per day for his services. At first, you might think this is a life-changing amount of money. Think about it, how much have you been able to charge for your services? Very few will have been able to charge anywhere near this amount. But think about this problem another way. If the consultant who could charge $5,000 per day, really believed in the untapped value of Paypal, a company that was paying him around $1.2 million pro rata for his services as an expert in business negotiations, he would have offered his services for stock options in the company. In fact, this is a true story, and the consultant didn’t go for stock options or a mix of stock options and cash; instead, he went for the cash. He opted for money today. In contrast to the professional consultant bagging $5,000 per day, think about the graffiti artist hired by Facebook to paint their offices. Imagine the look on Mark Zuckerburg’s face, if the artist had presented a bill of $5,000 per day to paint the office. In fact, the artist had initially quoted $60,000 for the job, but on the advice of Sean Parker, the artist did something else, something unusual, something the majority do not do. He didn’t ask to be paid in cash. He asked to be paid in stock options. A stock option gives someone, usually an employee, the right to purchase company stock at a certain price, for a specific duration of time. The artist cashed out those shares in 2012, for $200 million. A high flying business consultant, on top of his game, thinks he’s a winner by negotiating a $5,000 a day deal with Paypal. A graffiti artist paints Mark Zuckerburg’s office and makes $200 million. The world is full of irony. It’s what makes it interesting. In case you’re wondering — did it cross your mind to ask how long it would take to earn $200 million by making $5,000 a day? If you worked 365 days a year, 7 days a week every week, with no holidays — ever, you’d hit your target in just over 109 years. It’s easy to think that successful investors and speculators don’t get things wrong — that they don’t make mistakes. Here’s a quote from one of the most successful venture capitalists — ever: Peter Thiel. Eighty percent of your results come from 20% of your effort. Eighty percent of your turnover comes from 20% of your clients. You’ve probably heard of the 80:20 rule. It’s also known as the Power Law Distribution. In 1906, an Italian economist, Vilfredo Pareto discovered what you now know as the 80:20 rule, when he noticed that 80% of the land in Italy was owned by 20% of the people. The power law is everywhere. 80% of the revenue from Hollywood is made by 20% of the movies. 80% of global internet traffic goes to 20% of the sites. The power law, or 80:20 rule is seen in the natural world too. The majority might think that the power law is unfair. But it’s a natural phenomenon built into many natural systems. The law exists across many taxonomies. It’s seen in the metabolic rates of mammals, it’s seen in plants, bacteria, and cells. And it’s seen in man-made structures too, like companies. 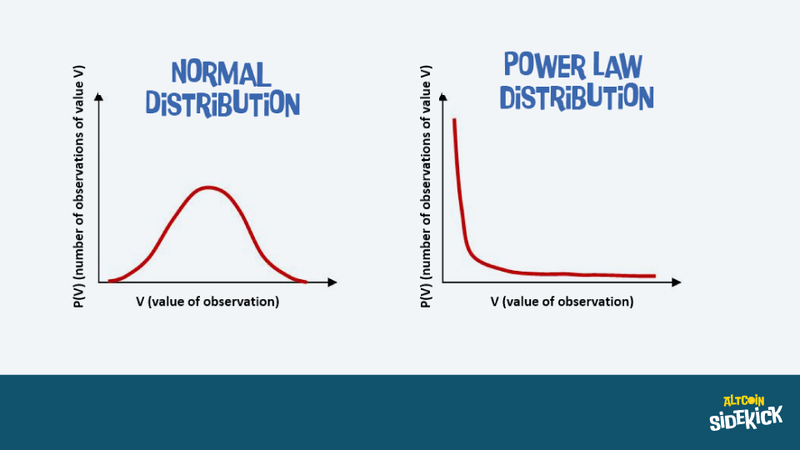 Here’s the power-law distribution side by side with the distribution you’re most likely familiar with. The bell-curve, also known as the Gaussian or normal distribution. In the normal distribution the results are clustered around the mean and spread out to the left and right. This is where you learnt the concept of averages and standard deviations from the mean. But the normal distribution is just one of many. The power law distribution tracks the proportional relationship between two quantities. One quantity varies as a power of another. The 80:20 rule of the power law distribution doesn’t mean the relationship is always 80% to 20%. It could be 90% - 10%, or 75% - 25%. Where the normal distribution can be used to find the average height of people at a party, there is no concept of average when using the power law. Human heights cluster around a mean and tail off at both ends. At one end, there are a few people over 7 feet tall, and at the other, people under 3 feet tall. Human height measurements cluster around 5’ 10 inches for a male, and 5’ 5 inches for a female. But with the power law, the results cluster at one end. To the right is the long-tail. To the left, the few that dominate. This is what the 80:20 rule looks like statistically. And so it is with financial markets and cryptocurrencies. The few control the many. The 5%, the most consistent and profitable group of investors, make their returns from the majority, the 95%. If you look at the source of the 5%’s wealth, it comes, generally, from investing in the financial markets, investing in real estate, or investing in a business. Other ways to generate wealth include the arts, be it actors, singers, writers, musicians, who, are paid some commissions from sales. The 80:20 rule, will affect the cryptocurrency markets too. 80% or some large number of coins will fail, only the small minority will succeed. Unfortunately, certainty does not exist in any market, including the cryptocurrency space. If you’ve ever played squash or tennis with a player much better than you, you’ll know what it’s like to experience the frustration. You are running back and forth, left and right — you’re all over the court. Your opponent isn’t. Instead, your opponent is hardly moving, taking a position in the centre of the court and placing the ball, long, short, left, and right. The 95% approach the business of speculation just like a beginning tennis player, up against, while maybe not a world class player, a seasoned tennis pro. The 5% use simple filters to make sense of the noise. James O’Shaughnessy in his book, “What Works On Wall Street” discusses the use of relative strength analysis. This is one of the simple tools the 5% use to make sense of the madness. Relative strength analysis is a quick and easy way to measure the comparative performance within the cryptocurrency space or any correlated financial market. The reason to dwell on the “most likely” phrase, is just because this is the default setting you use for almost all situations as you go about your life. If you were blindfolded and offered $10,000 to walk across a multi-lane freeway, you would decline the offer. You, for obvious reasons, would require certainty before doing it. Currently, at coinmarketcap.com, when you view all coins, you’ll see a list of over 2,000 coins and tokens to choose from. Outside of the obvious industry leaders, Bitcoin, Ethereum, et al., how do you decide which coin or token to take a position in? The vast majority use technical analysis, adding moving averages, stochastics, and other varieties of indicators, based on the underlying open, high, low, and close of the market in question. There is one little problem the 95% majority don’t consider. The cryptocurrency space is highly correlated. This means, when the leaders in market capitalisation and turnover go up, the rest of the market follows. And it’s the same, but reversed, when the leading coins go down. Put another way, technical analysis, as used by the 95%, won’t help you find which coins and tokens are being accumulated by the cryptocurrency pros. Technical analysis does not tell you which, of the over 2,000 coins, has the best shot at becoming one of the 20%. If you take a position in one coin, and you end up being right and making a profit, did any of the other coins or tokens go up more? The lower the price, generally, the higher the percentage move. The 95% are easily dazzled by high percentage moves, but very few take the time to investigate the supply and demand dynamics behind the move. The majority don’t consider which coins are being accumulated or distributed over time. The 5% use a schematic. An idealised model of how markets move through time. As a market is traded, prices will be in one of four phases. A downtrend, sideways accumulation after a move down, an uptrend, and sideways distribution after a move up. The 5% look for behaviour patterns that signal the likelihood that prices are about to transition from one phase to another, for example, a downtrend into sideways accumulation. One of the tools the 5% use to build their likelihood model is the level of fear in a market place. The signature of high levels of fear is seen in an emotion bar, a wide range bar, typically a daily bar, ideally with a gap down and an extended selling tail that is reversed by the end of the day. This behaviour pattern is most often accompanied by extremely high volume. This is what an emotion bar look like. The Bitcoin low on the 6th February 2018 is another example. Standard technical analysis techniques use moving average based indicators that attempt to highlight divergences between the momentum of price movement and the price movement itself. The problem is, moving averages, stochastics, MACD, On-Balance Volume, and on and on, are all trying to expose the same behaviour. The 95% place multiple indicators onto a chart and don’t realise that each indicator is cross-correlated. This means what they think are several independent systems, with each one reinforcing the other, is, in fact, doing the opposite. One reason for this is the 95%’s need for certainty. This group of investors and speculators spend a significant amount of mental energy checking and rechecking who said what, searching, hoping to find an opinion that’s in line with their own. Then they add the indicators. And they keep adding and fiddling with the settings until the see the results they want. They might use a different combination of settings because the new settings appear to yield much better results in backtesting — testing that's done, more often than not, by a 3rd party trying to sell a scanning system. Add to this the lagging nature of moving average based systems, and a pesky little problem called degrees of freedom, then you have, instead of a robust indicator of future movement, a system that is very unlikely to perform in the future, anywhere near its historical results. The 5% use levels of fear and behaviour patterns to assess the likelihood of a market’s next move. Nothing is certain. Nothing is guaranteed. The 5% keep track of a market’s movement through time as prices transition between the phases of the idealised schematic. No lagging moving averages. No indicators, except one. Volume. How do the 5% gauge the level of fear? As discussed in the 4th Dimension article, the fourth dimension of speculation is implied volatility. It’s a metric not well known or even heard of by the 95%. One way to measure it is to use a market’s underlying derivatives — specifically options. The SP500 index has an index that’s associated with it. It’s called the VIX. It’s made up of the level of implied volatility in the underlying options on the SP500. The VIX is an inverted index. When the VIX spikes higher, the level of fear in the SP500 is high. When the VIX is at low levels, and the volatility of the price movement is low, there is no fear in the SP500. If you use tradingview.com and study the VIX symbol, (CBOE Volatility index) check the times when the prices of the VIX spike higher against what happens to the SP500. What is the VIX measuring? The VIX made a recent low of 17.7. This is the market giving you direct feedback that it expects the SP500 to move 17.7 / 12, or 1.43% up or down over the next 30 days. What about the previous high reading on December 26th? The high in the VIX on that day was 36.20, and 36.2 / 12 = 3.01% over the next 30 days. The higher the percentage implied move, the more fear there is in the market, and the more expensive it becomes to protect the position against losses. In other words, as the level of fear rises, the cost of puts in the underlying market goes up. Coding a synthetic VIX for any market is possible. Here’s the synthetic VIX index for Bitcoin. But the 5% use another method. They take the values directly off of the underlying option chain. The price of Bitcoin is $3,542. The implied probability of the nearest strike price ($3,500), taken directly off the Bitcoin option chain is 73%. The number of days until the option expiry is 31. This means when prices were trading at $3,542 the fear level of Bitcoin was pricing in a move of +/- $752.68 over the next 31 days. This number is used by the 5% in two ways. First, the number represents the level of fear in the market. This number can be calculated daily and plotted. Second, $752.68 represents what the market is pricing into a one standard deviation move over the next 31 days. The 5% take notice of the price action outside of this range, because statistically, the price should settle in a range +/- $752.68 from $3,542 68% of the time. Any move outside of this range is of interest because it is not expected or priced in. The 5%, don’t use back-fitted technical indicators on charts to take positions. They use direct market feedback. They use behaviour patterns, like emotion bars, that indicate the levels of fear in the underlying market is high, and they use implied volatility as a gauge of unusual price action. In contrast, the 95% use social media, articles, and technical analysis to take positions. As the cryptocurrency market downtrend continues, article writers and market commentators come up with reasons why one coin will outperform over another. If you go to coinmarketcap.com and view all coins, you’ll see that the coins are ranked, by default, by market capitalisation, highest first, going down in descending order. One useful technique is to sort the list by 7-day percentage move. Coinmarketcap.com ranks the coins using a ranking formula. Higher ranked coins on coinmarketcap.com have a large market capitalisation, and, generally, large market capitalisation coins don’t have large percentage moves. By sorting the list by 7-day percentage move, you can see what coins don’t belong near the top of the list. This is a simple method to perform a relative strength analysis. A high ranked coin with tens of millions of market capitalisation, shouldn’t be close to the top of the 7-day percentage move list unless it’s being accumulated. 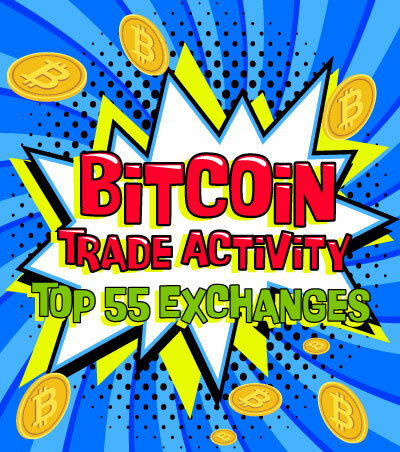 One or two days is not enough, but if the coin is appearing near the top of the list for weeks, then the coin can be placed on a watch list and analysed further. A coin consistently outperforming its peers could be being accumulated. This is not a buy signal. It’s a way to filter out the noise and investigate further. But this technique can also be a trap. 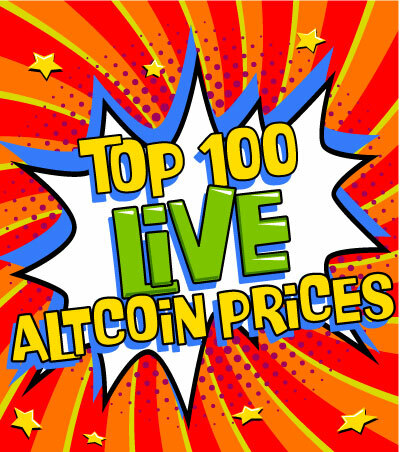 Recently a coin ranked #65 on coinmarketcap.com has been appearing near the top of the list. The coin is PayPie, and coinmarketcap.com lists the market capitalisation as $59 million. Here’s the trap. The 5% take notice of the volume of trade. PayPie recently jumped from 7 cents to 71 cents, a huge move on a percentage basis. But the 5% are not wowed by large percentage moves. The 914% move in PayPie had just $256 of volume. The daily volume on this coin is very low and negates any percentage move it is having. The 5% don’t only check out the volume. They also look at the recent prices and ask what range PayPie has traded in recently. If you take the time to look, PayPie was trading over $3.50 in early January. Although sorting the list of coins on coinmarketcap.com is a useful technique to find potential future winners, the 5% understand it’s just a starting point. Ask yourself this. If demand for a coin is high, would a coin worth tens of millions by market cap be turning over just a few thousand dollars a day in buy and sell orders? Relative strength analysis is a useful and efficient way of finding coins for further analysis, but no matter what tool you use to do the analysis, it’s not enough to look at the price move alone. The 5% take note of the accompanying volume and the recent trading ranges, because high percentage moves without volume are a huge red flag.